Look what fans can get with a number one global trending topic! Not only a brand new Kylie Minogue single, but a brand new video to boot. 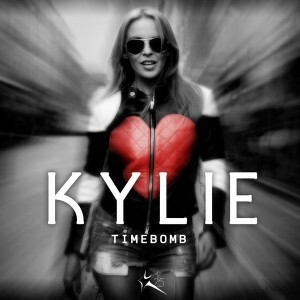 Yes, the clip to Kylie’s newly released track ‘Timebomb’ has just dropped and she’s heading out from the studio and into the streets of Soho in London, where her unsuspecting public are going to be in for a treat. She drops into a nightclub for a little dance, parades past the infamous G-A-Y to say ‘hi’ to her peeps, pops into a Porsche drop-top for a trip around town and then heads into a darkened doorway with a stranger where things get a little awesome and experimental. We’re actually really liking this clip on first watch ’cause there are definitely sparks of experimentalism in sound and vision. And that, friends, has us very, very excited for what maybe to some from our Impossible Princess when she runs to the future and jumps. We feel we have to defend the team at Warner here to some extent. EMI doesn’t hold the rights to the early PWL stuff in the UK – PWL does. EMI only holds rights to all of Kylie’s material from ‘Spinning Around’ onwards, so it would have no bearing whatsoever on the pre-‘Light Years’ material. If Warner wanted to license all of the instrumental/remixes etc that were available on the UK iTunes store, they’d have to pay big dollars for the privilege. They wouldn’t recoup the costs, sadly. And most Kylie fans would have long ago sought them out for illegal download. The ‘Love At First Sight’ thing is a bit silly (and we’ve brought it up with them on our readers’ behalf before). As for ‘Timebomb’, we know that the powers that be have been working frantically over the past week trying to get the ‘Timebomb’ video live to iTunes. Whether it’s an issue at their end or at iTunes’ end, we’re not sure. But believe us when we say that they want it out there almost as much as you do! Really sick of these endless Madonna vs Kylie comparisons. Can’t we just enjoy them both for what they are? I have this feeling that when Madonna sees that clip she’ll be both pissed and jealous. It makes Madonna look so much older and silly. Dont really understand why this is not on her new Greatest hits collection. Strange she has a new single and video and its not on it ???? ?